Deployment Debrief 2016: Unboxing, Waves, and Staging Timeline | Redux & Co. Fellow backers have begun to share their unboxing shots on Kickstarter and also on Instagram at #COURGcrew. Riley H. snags the first #COURGcrew #WOTD on Instagram. Timur G. posted up his COURG arrival in Russia. somethingsaid in Spain logged the first COURG Zero Hour sighting. Enoch. Y. shot his unboxing: 1, 2, 3, 4. Squaregetaway represents from the USN. Roberto strapped on his COURG on his way out the door enroute to a Costa Rican adventure. 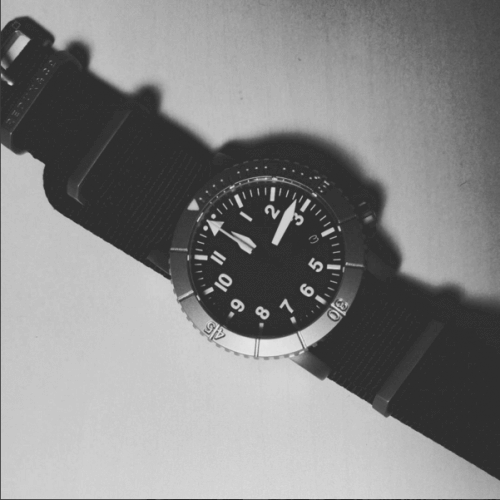 Darkmirage also posted a nice little unboxing series on Watchuseek that included this sweet shot (leather straps, his). Thank you, COURGcrew — I can’t wait to receive my own COURG and you’re making the wait hard to bear! I’m sharing the pain because I’m last in the queue after all units have deployed. Those are some of the 500 COURG units we’ve deployed so far. If we’ve deployed your COURG, we’ve dispatched an email from HQ with tracking intel. I wish the tracking link provided were better, but that’s what we have to work with right now, and I thought it would be better than having you go through the hassle of entering it. Please check your spam in case our dispatch was flagged for some reason. Waves? To be honest, I had expected we could ship everything all at once. But this has not been the case and instead of holding everything up, we decided to move ahead with a wave strategy, so I hope the anticipation isn’t too much to handle. Completed components have arrived in batches rather than upon completion. Field operatives decided to hand check each package and make final inspections personally. In fact, our operatives spent many late nights make final tweaks to some Mission Logs and Mission Folios to secure stitches and clean up some stray threads. In addition, that closes the accountability loop for any servicing and warranty issues that might arise if their team drops or mishandles and we don’t know about it. That’s because they were not comfortable delegating pick and pack duties to an entity unfamiliar with our gear that might cause mix-ups. If there’s a problem with your COURG unit, we’ll know for certain it was incurred in shipping or after arrival. Our service teams will then inspect the watch and determine how the COURG sustained the damage. In the end, I believe this is the right call and am grateful for our field agents’ diligence and dedication to our project. It’s yet another reminder to me of the importance of building a foundation early on to systematize our workflow. Wave 1: Titanium grade 2 Type-A stock kits, with no leather strap add-ons. Quantity = 200. 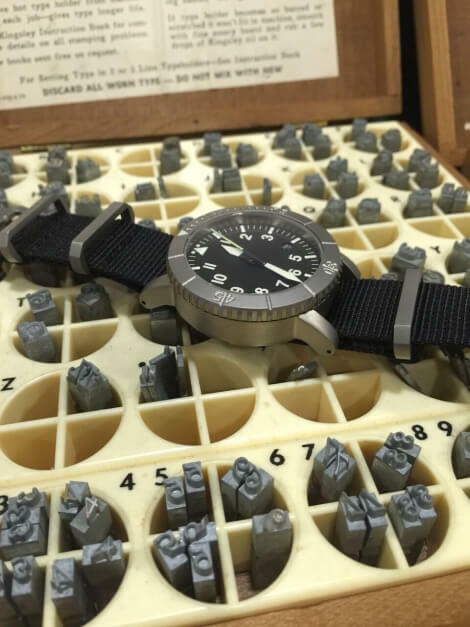 The reason why the first wave enlisted only Type-A’s with date and mil-straps was because those were the first variants to arrive from the dial manufacturer. As we hit the Christmas closures, they wanted to get as many units out as possible so focused their effort on preparing the first available variant. Wave 2: The second wave included multiple titanium grade 2 variants and added some Horween strap orders. Quantity = 300. That’s a mix of Type-A, A-11, Zero Hour, Minimalist, Type-B, dates and no-dates. Many of you have asked that we declare the package to customs as a “Gift” or for a nominal value, but our legal consultants and other companies with vast experience advised us to declare a reasonable value or risk serious consequences. The declared value on the COURG is $199 USD. Titanium grade 5 COURG batches scheduled to begin reporting for duty and deployment prep from 10-20Jan. 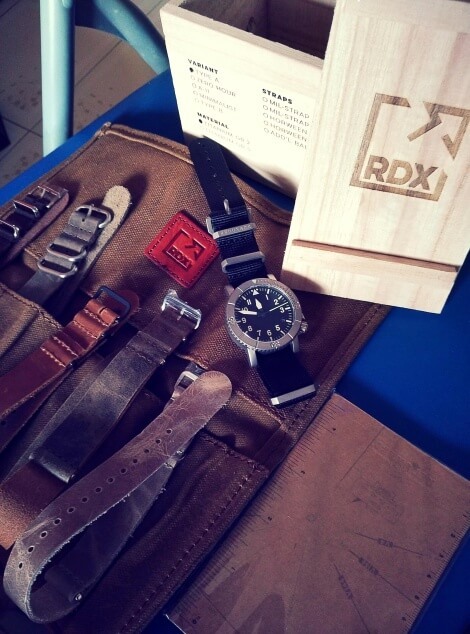 Leather mil-straps scheduled to begin arriving at staging location in two days. Working hard to have everything shipped before Lunar new year festivities that shuts everything down in Asia for 3-4 weeks in February. The NH35 is a workhorse and has proved its reliability in the stable of Seiko’s venerable line-up over many decades. However, as with any finely tuned machine, the NH35 still requires care so please review the Operator’s Manual section on the back cover regarding functions and best practices (such as when NOT to change the date) before you mess with the crown. The COURG features a screw down crown that may be factory-installed tightly. Turn the crown counterclockwise firmly with your fingers, and not with pliers or some such. The factory did not use enough torque to require rotation with hardware to unscrew. When the crown releases, an internal spring pops the stem up into the first position (movement winding, clockwise rotation). From there, a light pinch will move the movement’s gears into second position (date setting, counterclockwise rotation). You should only use the strength in your fingers as opposed to yanking or pulling hard with your hand/arm. One last pinch outwards will move the movement to time set gears. I’m sorry I have not been able to keep up with messages between blog comments, emails, Kickstarter messages, Kickstarter comments, Facebook, and Twitter. As you know, fellow backer and comms first officer John Boehm has helped field queries from the Kickstarter comments area. John has kept me updated as issues cropped up. Many thanks to John and others who have worked to help field questions and lend a hand on deck. There’ve been an understandable flurry of excited/worried/anxious “Where’s my watch” emails and unfortunately, we won’t be able to answer until you receive the tracking email. In the future I’ll want to plan to have a status page where you’ll be able to see the exact status. For now, the best indicator if you haven’t received a tracking email is to check the BackerKit profile. I felt like in some ways that as a business we skipped from a crawling infant straight to a teenager behind the wheel for the first time. But I also know that this growth spurt is an opportunity to set the stage for a meaningful developmental phase. So, I thank so many of you for how you’ve encouraged and brought constructive criticism to help us ease the transition into a responsible and productive member of society in less than a year. Your patience is gracious and your confidence in us, invigorating. Tackle your 2016 missions, and Godspeed. elbert, over and out. 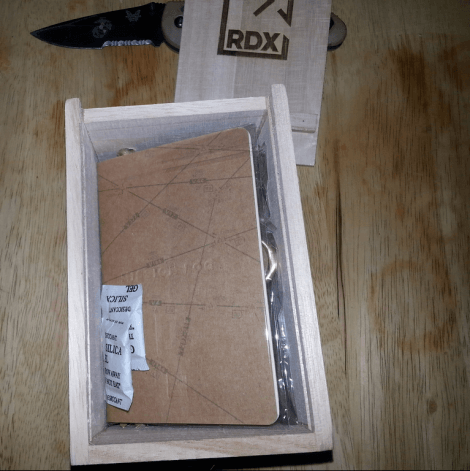 This entry was posted by pilot in News and tagged backers, COURG, COURGcrew, horween, kickstarter, Mission Log, Notebook, titanium, titanium grade 2, titanium grade 5. ← Deployment Phase: Greenlit, GO.